Johann Gutenberg is working on printing the first Bible with type. Twelve-year-old Hans Dunne works in Gutenberg's shop as an apprentice printer. Soon, Hans finds himself in the middle of a type-stealing mystery. Will Hans, and the other pressmen be able to keep Herr Fust from getting the type? Will they be able to finish the Bible so many people will be able to read and learn from it? 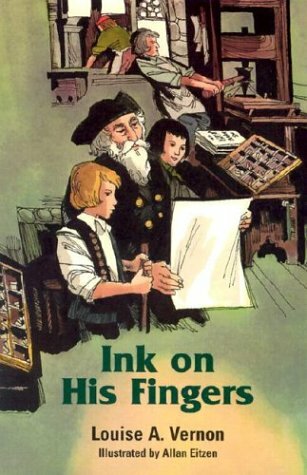 The National Association of Christian Schools honored Ink on His Fingers as one of the best children's books with a Christian message released in 1972.